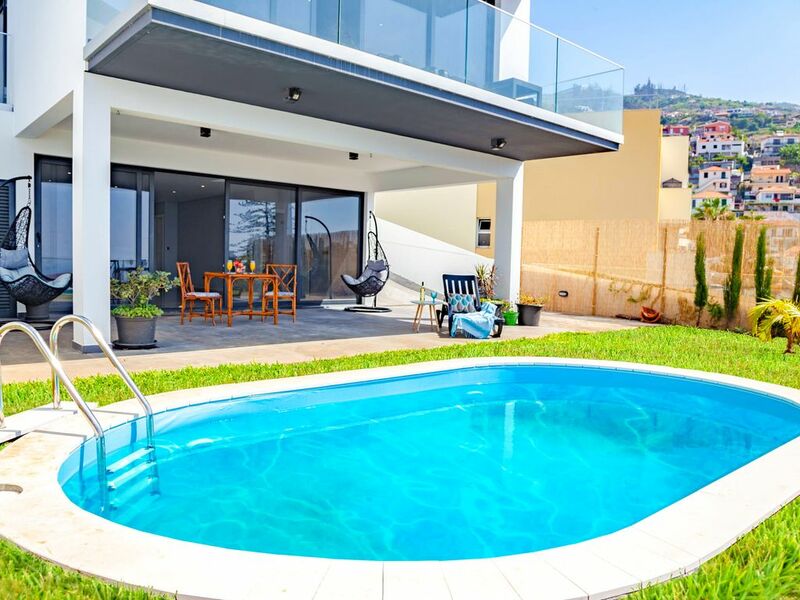 The Villa 2theOcean is a stunning home, overlooking the Funchal bay area. It is modern, with lots of natural light, due to the floor to ceiling windows/sliding doors found though out the house. The 3 bedrooms are found on the first floor and all have ensuite bathrooms. The Master bedroom, spacious with lots of closet space, boasts spectacular views of the sea. On the ground floor, the open space lounge and dining area lead directly to the balcony and outdoor eating area, and barbeque. The fully equipped kitchen is also found on this level. From here one can go down a flight of stairs to the private climatized swimming pool. On this level is a games room, where a snooker table and card/ board games can be played. Wi-Fi is available throughout the villa. There is also a garage on the property. The Villa is located in a friendly residential area, approximately 2.8km from the center of Funchal, and 16km from the International Cristiano Ronaldo Madeira airport. It is ideal for families, friends and couples, looking for a home that is in the outskirts of the city, allowing one to have the best of both worlds. We loved our stay here. Lots of modern amenities, beautiful bathrooms, great views. The master bedroom has an amazing closet as well. The neighborhood is very nice, with a great little cafe (Sesamo) within walking distance. The property management staff are very nice and helpful as well. One thing to keep in mind is how hilly it is--here and everywhere in Madeira! That made parking our rental car a bit scary, since the property is at the bottom of a steep hill down a narrow driveway. I am a novice driver of standard shift cars, so I chose to park on the street at the top of the hill from where the home was to avoid accidently hitting anything while on the steep driveway. Loved our stay here and Madeira!! Highly recommend. Looking forward to having you back in the near future. Haus neu, Interieur neu, alles zum super wohlfühlen.